Emperor Wray Vasteri was the ruler of the Tornian Empire. His House has ruled the Empire ever since the great infection, which struck over five hundred years ago and he feared he would be the last. The number of compatible females was dwindling faster than anyone knew. If they could not find compatible females soon, their entire civilization would cease to exist. It was the reason he agreed to meet with Liron, the Emperor of the Kaliszian Empire in Kaliszian space. It was the only reason they had crossed paths with a Ganglian ship leaving Tornian space, and it was the only reason that the small female was discovered. Could she be what they had been searching for? Wray found himself drawn to the small female he’d found beaten and abused on the Ganglian ship. She resembled a Tornian female, but was much smaller. Could she be what he had been searching for? Kim Teel has had a hard life, at least she thought she had, until her parents were suddenly killed and then her sister and brother in law disappeared. At nineteen, she realized she’d been protected from all of life’s hardships. She had been cared for and loved her entire life had come to expect it. She was terribly spoiled. Determined to change her ways, Kim went looking for her sister, only to be captured by the Ganglians and it was then she learned what happened to the ‘unprotected’ females of the universe. Wray and Kim are both doing the same thing, trying to survive. But what they find is that there are more important things than just survival. And once they learn that, the universe changes forever. 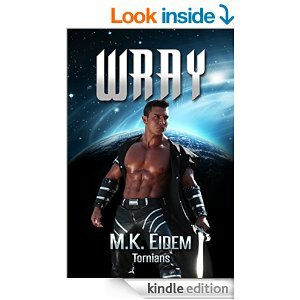 Wray is book two in the Tornians series- a much anticipated one. However, it is an interesting follow-up to Grim (Book 1) because it is actually written as a prequel! That being said, read Grim first- or if you don’t, skip the prologue and epilogue of Wray till after you do so! Kim is all alone on Earth after a series of accidents- and one moment she is searching for her sister in the woods, and the next she is abducted by disgusting aliens. Luckily for her, the ship is intercepted by a Tornian shuttle! Even better, the man that rescues her, Wray, is her Warrior. While a traditional theme of “no females left, but humans may be compatible,” shows a unique manner of societal evolution when there is a deficiency of women. Women have become cold, heartless, b*****s; only looking out for themselves. They have no regard for their mates or their children. Of course, a kind, compassionate earth woman blows the men out of the water!